Covered Bridge House - Jackson NH and Mt. Washington Valley Area Information. Pumpkin People, Tradionally Yours Events, Lodging specials, Dining and Ski Area Info. 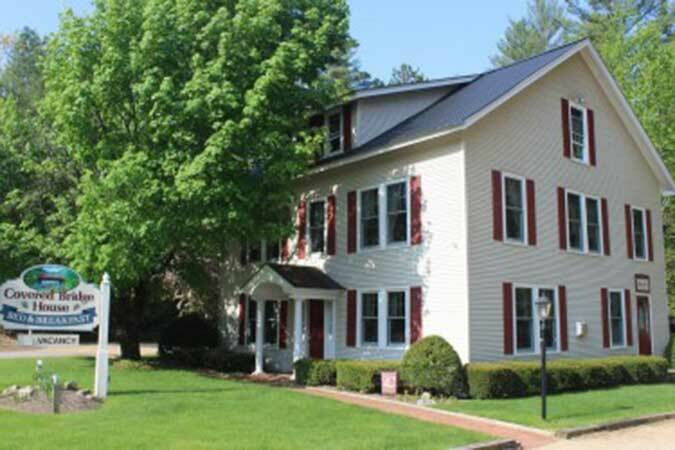 Enjoy the comfortable, informal atmosphere of our cozy B&B located on the Saco River. We offer six tastefully decorated guest rooms in traditional country decor. Four of our rooms feature queen size beds and private bathrooms and our other two rooms connect to form our very popular family suite. Start each morning with a hearty country breakfast served in our sunny dining room or on our outdoor patio in warmer weather. Swim or tube down the river, sunbathe on the smooth river rocks, or soak in our outdoor hot tub after a full day of hiking, skiing or shopping. We are close to Nordic & Alpine ski areas, outlet shops, golf, Story Land, the National Forest and many excellent restaurants.